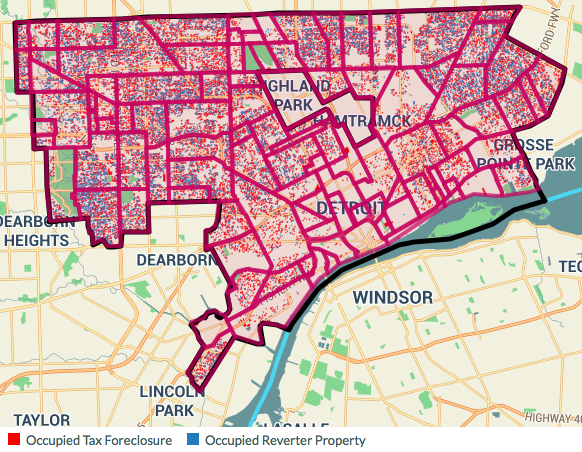 This year alone, over 80,000 Detroit properties received tax foreclosure notices. Among those properties were vacant plots of land, abandoned buildings and yes, occupied houses- homes with people living in them. While Detroit banks in glow of positive press post-bankrupcty and aims to attract new residents, the city isn’t doing nearly enough to keep the people who have been here all along. The Great Recession hit Detroit hard- approximately 67,000 properties went through bank and tax foreclosure between 2005 and 2007. This year alone, tax foreclosures alone may surpass that number. That, taken with the fact that many Detroit neighborhoods have fewer residents now than they did then, and that a greater portion of the properties in foreclosure are occupied residential storms, means that we are facing a crisis of unprecedented proportions. Michigan state law (Public Act 123 of 1999) mandates tax foreclosure for any property behind on its taxes by 3 years or more. This aggressive law applied to a poverty-stricken population with a broken tax system has led us to our current situation- a tidal wave of foreclosures. It’s not that people shouldn’t have to pay taxes: government can’t survive without funding to provide services, sustain infrastructure, and grow. Property taxes are among the more progressive models of funding governments, since property values tend to scale with wealth. However, the property tax system in Detroit is severely flawed for a few basic reasons: high taxes, over-assessments, poor implementation and excessive fines. Property values are chronically over-assessed. State law mandates that property values must be re-assessed annually but Detroit has not had the will (why do reassessments that would lead to lower revenue?) or means (bankrupt city with little capacity for such a monumental task) to do adequate property assessments in recent years. Mayor Mike Duggan admitted as much, and this year applied a blanket property value reduction to large swaths of Detroit properties. But these reassessments are not retroactive and are still inflated far beyond actual property values. Even if a property is correctly assessed, tax rates are exorbitant in the city of Detroit. This is especially troublesome given the fact that the services taxes are supposed to pay for are often severely lacking. The city is taking mammoth strides to improve garbage pick-up, tear down blighted buildings, and provide street lighting, but services still fall short of what many cities take for granted, and residents are still expected to pay premium prices for less. There are serious concerns about the process by which the city and county issue tax bills and foreclosure notices. Many residents never receive a tax bill in the first place, and aren’t given to going out of their way to find more bills to pay. A homeowner who has finally paid off their mortgage may have never received tax bill since it was sent to the bank, they think they own the house free and clear but find themselves facing a foreclosure notice 3 years later. Other residents complain that they never received a foreclosure notice. The county is supposed to make an effort to verbally engage with a resident when issuing a notice, but that is not the practice. To clear up complaints about due process, the county has taken to issuing up to a dozen foreclosure notices in that menacing yellow plastic packaging for a single house. Whether you fall behind in taxes because you couldn’t pay or didn’t know you were supposed to, the consequences are enormous. State law mandates an 18% interest on back-taxes, making any hole all but impossible to climb out of. Fortunately, a recently-passed law cuts that interest rate to 6% for many owner-occupants. Controversies converge in some cases where overdue water bills are converted to liens on homes, meaning that some properties go into foreclosure even when their taxes are not overdue. It makes sense to fight tax foreclosure in Detroit even if you don’t feel sympathy for the Detroiters who have stood by their city for so long, only to be kicked out. Looking at the financial analysis alone proves that this does not make financial sense for the economy at large, especially in the case of occupied residential homes. It costs more to demolish a building (approximately $12,000 of tax-payer money) than it would to pay in full the back taxes (average $3,200 in the 2014 foreclosure auction), not to mention the untracked social costs of human displacement. A person without a home is homeless- Detroit already has approximately 40,000. A home without a person is a blighted building- Detroit already has 80,000. Foreclosure and blight have an 80% correlation rate in this city. These problems are already monumental and will require years of effort and funding to address, yet local government is actively aggravating both processes by carrying out massive tax foreclosures. Hello. I am trying to find any legal help that I can. To make this short I will simply say that we never received any foreclosure notice. We were very well aware of the 2012, 2013, and 2014 past due amounts. Redford township had purchased our home in June 15th. The home evidently went into foreclosure on April 1st this year. The sad part is We have the money to pay all three years now!! Redford has our home slated to be renovated and put into a program called S.N.A.P. If ANYONE could try to aid us in any way at all we would be very grateful. Even more sad is that we purchased this home for cash four years ago. How does this happen under our radar?? If you can share your address, I’ll look this up to see if it is or is not in the auction. If its not at auction and Redford owns it, you will have to approach them to buy. They may have transferred it to the Michigan Land Bank but I doubt it since it’s occupied. It has been well over a year since my posting. Thank you for the reply though. My wife and I sure would like to get some documentation on the line of communication that has left us and many others blindsided. We have been renting since last Fall. We are in a class action lawsuit with eighteen others, Our lawyer was trying to have our case heard before a federal judge. I just read that we have to take the case back to state. Thank you. Any information would be appreciated by us and our lawyer. We replied last September! What is the lawsuit? Not the ACLU one is it? Hello! The Meridian Law Group had notified us and many others. There are a few other class actions that were filed by other attorneys. All of us claim to have no idea that the deeds to our homes were no longer in our names. Yes, we wee blindsided in August of 2015 when we went downtown to pay off the 2012 taxes. They told us to talk to Redford. Mike Dennis is in charge of the housing authority for Redford. Mike Dennis’ remark, “Sorry you may as well pack!” There is no way to sugar coat that message, but he didn’t need to rub salt in our wounds. I will get back to the rude comment later. I do admit that I was down at the 400 Monroe building three times in late March 2015. After hours in line I would get a employee that seemed distant and vague. I needed definitive answers. I had cash to pay, but these figures wee being explained to me through bullet proof glass, no eye contact, monotone verbal manner. The message was clear. “If you default on any one of these arrangements you loose.” Now that is that a deterrent? So even if we either miss a payment or somehow your broken down system does not acknowledge a payment was received, the agreement is void. The circle on confusion and doubt. In my mind I screamed to just sit down with a person. One on one PLEASE! I did. I went down to a different floor. I nice helpful women looked over my papers wrote down some scribbly figures. She said, and I am paraphrasing, “Sir, if you are uncomfortable in making any arrangements today you do have some more time.” In fact last September as I dug around for information I learned that there were actually three different deadline extensions. Here is where the lines get blurry. I do however have emails to support our argument of how we were told to just wait until the first week in August. So we did. The time to have any redemption had lapsed. I agonize for not entering into an agreement back on March 31 2015. In hindsight we had nothing to loose. Myself along with many others shared a look of uncertainty. The lawsuit claim that we were all mislead with malicious intent to defraud us out of our property. Well I don”t want to believe that there was a deep rooted conspiracy, but I do know that with the tone and level of intimidation from Mike Dennis the message was clear. Get out! We felt deeply that they pounced on this mortgage free home. Redford paid less than $8000 and had no problem smearing it in our face of our loss. So we took several thousand dollars and retained a lawyer. I did not finish my post. We do not want to come across as helpless victims. I spoke with countless lawyers before retaining Meridian. A lot of them wanted to file under violation of due process which is a big factor in this case. We never did receive a yellow packet, a knock on the door, any mailings other than a quarterly notice with that years past amount. Maybe you saw Guy Gordon’s story in April. Mr. and Mrs. King of Westland. That about tells the story. Many of us were under the impression that “Everything is fine! Just come downtown and see us in August. by then homes were bought within minutes the day the redemption period was over. The time stamp on the quit claim deeds shows immediate transfer of ownership. I know in my gut that if a judge would really listen to the chronological order of communication, see our emails, note the absence of ANY photos that prove the process server had attached notice to our home, and any other notifications they say were mailed. These are the intricacies that I fear will never be heard. My share of blame is the lack of due diligence. I should have not taken there word on face value. I should have tried harder to protect my investment.